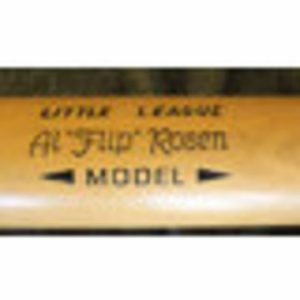 The kid’s first bat was an Al “Flip” Rosen model, thirty-two inches of the finest white ash, straight-grained, balanced weight, narrow grip, moderate barrel, more than enough to clear the dusky red snow fence in a junior league game. Burned into the wood was the logo: Hillerich & Bradsby, Louisville Slugger. There were a few maple bats around, even one turned from hickory, but complaints followed them: too heavy, not balanced, uneven grain, barrel too fat, grip too thin, breaks too easily. The kid tried them all, finding only one, an Adirondack 302 turned from—you guessed it, northern white ash—that passed as a fair imitation of the genuine article. 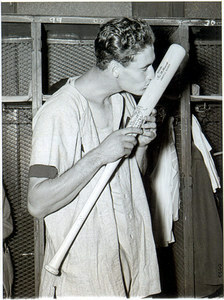 In later years, he graduated to a Ted Williams model, thirty-five inches, slender grip, medium barrel, perfectly balanced, and bearing the imprimatur from Louisville. With time, dreams fade. Successes and failures on the diamond are replaced with living in the world. College and grad school, marriage, family, career. He buys an old farm house in Vermont, one that requires he burn wood for heat. The walls are thin, the only insulation corn cobs and newspapers from the nineteenth century, and he’s not sure of the age of the grumbling, guzzling oil furnace perched on a concrete slab in the dirt-floor cellar. Long after the house is restored, he realizes he’s in love with the rites of the wood pile—hickory, cherry, oak, maple, butternut, ironwood, beech, birch, ash—he knows them first by the bark, then by the color and nature of the wood grain. He knows that seasoned oak or hickory will hold the fire overnight, that birch burns hot but fast, that maple is a best bet for steady, even heat. He acquires the proper tools—an ax, wood wedges, a twelve-pound splitting hammer, an old radio that will pick up Sox games on the AM band if the cloud cover is right. Then, sixty years after dream time, the winter of winters slams the country, sends a Canada Clipper south into Vermont, temperatures dropping through the single numbers to zero, minus ten, minus twenty, and his cords of seasoned hardwood vanish earlier than ever before. He turns his attention to this year’s cut: beech, hickory, maple—much too soon to burn any of those—and an abundant cache of white ash. If the logs are kept a year. If for long ’tis laid away. Is fit for queen with crown of gold. Blaze up bright and do not last. E’en the very flames are cold. Is fit for queen with golden crown. Fills your eyes and makes you choke. With an incense like perfume. Keep away the winter’s cold. As he fills the wood racks with ash, he admires the pale, straight grain, runs his fingers over the smooth surface, and wonders why he thinks of baseball. He stokes the Hearthstone stove, sits in his rocker, cat curled on lap, feet as close as he dares get them to the fire, and sleeps. In the dream, he’s a kid again, a length of mountain ash in his hands, stepping to the plate at Fenway, knowing the first pitch is headed for Lansdowne Street. John Philpin is the author of twelve books including Bad Dog (2012) and Shattered Justice: A Savage Murder and the Death of Three Families Innocence (2011). He was a catcher for the Hull High School Pirates back in the day. Excellent article! I’m sure all followers of “Boston Baseball History” will like it. All the best yo you from D. O. D.
My brother would have loved all these stories of his heroes.